Lebanon Opera House is prominently situated on the Colburn Park green in historic downtown Lebanon, NH. Since 1924, LOH has served as one of the cultural cornerstones of the Upper Valley region as a vaudeville theater, movie house, community gathering place and city hall. Longtime residents and visitors alike will find ample parking and compelling pre- and post-show destinations within walking distance. The lobby is open starting one hour before show time. Check the delivery method on your ticket order: for Email, you can print at home or show the tickets on your phone. For Will Call, pick these up at the booth in the lobby. The Will Call booth is located in the middle of the lobby, on Level 3 via the City Hall elevator, or street level from the North Park main entrance. If you need to purchase tickets, the Box Office is located in the south-west corner of the lobby, to the left of the main entrance. Restrooms are available, many artists provide merchandise for sale, and often we invite local nonprofits to provide light refreshments and to meet our audience. If you are planning on dining out before the show, there are several nearby restaurants within walking distance. There is no dress code for attending LOH events. Please dress comfortably as you would in any public space. Coming to a show is a special occasion, so some of our patrons choose to dress up, but that choice is entirely yours. We do ask that you be aware of your choice of scents, colognes and perfumes, as you will be in fairly close quarters. Doors usually open 30 minutes before show time and we recommend arriving in Lebanon at least 45 minutes before the start of a show. Do your best to be prompt! For most shows, late patrons will wait outside the theater with an usher before being escorted into the theater during a suitable pause. This allows us to minimize the disturbance to the artists and patrons. We sincerely hope you enjoy your visit to LOH; please do not hesitate to ask any staff member for help or assistance. Lebanon Opera House is located on the Lebanon Green (Colburn Park) at 51 North Park Street, Lebanon, NH 03766. As you approach the Green, look for Lebanon City Hall on the north side of the park. We are in a large, red brick building with white columns (well, technically pilasters) and a clock tower. Lebanon Opera House is accessible from street level at the front of the building and by elevator to the Lobby and Orchestra level through the City Hall entrance on the east side of the building. Take I-89 to Exit 17. Make a left from exit ramp and follow Rt. 4 a few miles into downtown Lebanon. On Street Parking: Free parking is available along Colburn Park (Lebanon Green) and surrounding streets. Parking Lot: Public parking can be found in the lot directly behind Lebanon Opera House via Flynn Street. Advance Transit Blue and Red Line buses stop directly in front of Lebanon Opera House throughout the day. The last bus on the Red Line departs for West Lebanon at 6:15 pm, and the last bus on the Blue line departs for Hanover at 6:45. There is no bus service on weekends. Outdoor bike rack parking is available adjacent to the City Hall entrance on the east side of the building. LOH is located a few hundred feet from the entrance to the Northern Rail Trail via Spencer Street or Campbell Street. Recommended bike routes from points North include Mount Support Road to Hanover Street, from the East along Mechanic Street, and from the West along the Northern Rail Trail or Bank Street. Biking from the South is possible for advanced cyclists via Rt. 120. Lebanon Opera House strives to provide access to all events and programs to everyone regardless of age, ability, gender, sexual orientation or economic standing. LOH endeavors to identify barriers to this goal and make improvements to ensure our venue can be accessed by all. The lobby, box office, rest rooms and orchestra level of the theater are accessible by elevator, which is located through the City Office entrance on the on the east side of the building. 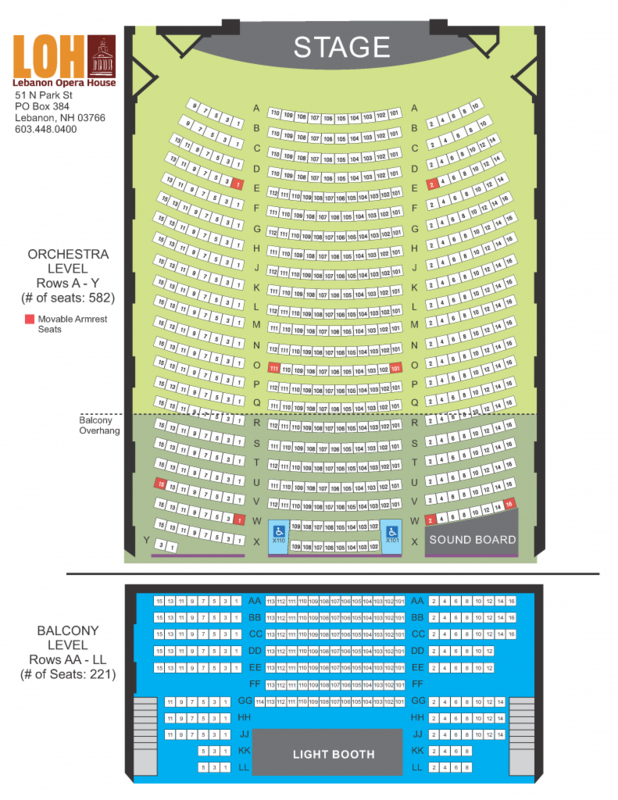 We have two dedicated wheelchair seats in the orchestra section, each with companion seats. In addition to the wheelchair seats we also have eight seats at the end of selected rows with arm rests that fold up for those with limited mobility. The balcony is not accessible by elevator. LOH has hearing assistance devices available at the box office free of charge. 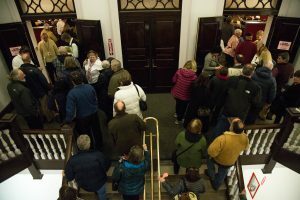 If you need access to any accessible seats for a show that is either reserved seating or general admission, or if you would like specific access information, please contact info@lebanonoperahouse.org or call the LOH Box Office 603.448.0400. I bought tickets through secondary market sources (i.e. “scalpers”) online or in person. Are my tickets legit? LOH does not endorse using any third party ticket resale sources. Our Box Office can not resolve any issues involving them, such as lost tickets or bogus tickets. Tickets for all of our shows are sold via lebanonoperahouse.org, in person at the Box Office at Lebanon Opera House, or by phone at 603.448.0400. Tickets are sometimes available through fan club sites as pre-sales or special VIP packages. Very rarely, LOH will authorize the sale of tickets for less than face value through third party vendors. When in doubt, always call to ask. LOH has the right to cancel ticket transactions that are suspected of being purchased for the sole purpose of reselling (scalping). What time does the show actually start/when do doors open? The time on your ticket is when the show is scheduled to start. Of course, some artists are more punctual than others! The doors to the theater usually open 30 minutes before showtime. In the case of General Admission shows, be aware that there may be a line forming up to one hour before a show in the lobby. The box office is open from noon straight through show time if the event is Monday through Friday, and we open one hour before the scheduled show time on weekends. The Box Office is also open through the first intermission and we ask that purchases for other shows take place during that intermission. When possible, the inclusion of an opening act will be announced ahead of time, however artists will sometimes bring a surprise opener with them. Either way the show will start with the opening act at the advertised time and the headliner will follow. If a show is billed as “an evening with”, there is no opening act and the headliner will take the stage at the advertised start time. How do you define “Senior” and “Child” priced tickets? Unless otherwise noted, prices for seniors are 65 and older and children are 17 and younger. On occasion, a show will have “student” pricing which includes any student currently enrolled in an educational institution, with a valid student ID. Children younger than two do not need a ticket. This varies greatly with each show, but most are over before 10 pm. LOH does not allow flash photography as it can be distracting to other patrons. The individual artists often have their own policies, but many allow non-flash photography with personal use cameras and prohibit video recording. More restrictive photo policies will be posted and announced at the show. Unless otherwise noted, shows at Lebanon Opera House are all ages. Children younger than two will be admitted free, otherwise, everyone must have a ticket. Certain shows may have age restrictions but that will be evident on the event sales page online. What is your non-smoking policy? Smoking is 100% prohibited and will not be tolerated. There are three designated smoking areas a short walk from the doors of LOH, including one across the street at the northeast corner of Colburn Park. I ordered tickets online but didn’t receive the confirmation. What do I do? When you successfully complete an online ticket purchase a confirmation number is displayed in the order window. If you don’t see this when ordering then your purchase has not been completed. An email confirmation will also be sent. If you don’t receive the email check your spam or junk folder for the confirmation. If it’s not there, please call the box office. If you bring your ID to box office, we can almost always re-print your tickets. May tickets be refunded or exchanged? All ticket sales are final and non-refundable. Tickets may be exchanged for another show or gift certificate, however, as long as they are received more than three days before the performance. A small exchange service fee may apply. Tickets may also be returned to the box office at any time before a show as a tax-deductible donation to Lebanon Opera House. I ordered tickets online but I did not see an option to have my tickets mailed to me. Email – You will receive an email containing one or more attachments (PDF documents) that serve as printable tickets. You must print these tickets and bring them with you to the event(s). Ship – Your order will be shipped to the shipping address you specify at the time of your order for an additional fee of $1.00. The package you receive will contain hard-copies of your tickets. These must be brought to the event(s). Please allow six business days for delivery. Will Call – No tickets will be sent to you. Simply show up at the box office on the day of the event(s) and provide your name. Only the person that placed the order can redeem the tickets. You must have a valid ID in order to be able to redeem the tickets. Is food and alcohol available during the show? Local non-profit organizations often sell light snacks/desserts and non-alcoholic beverages in the lobby before a show and during intermission. Please consider supporting these organizations. Food or drink (except water) are not allowed in the theater so all refreshments must be consumed in the lobby. Because LOH is located in a municipal building, no alcohol is allowed on the premises. The lobby, box office, rest rooms and orchestra level of the theater are accessible by elevator, which is located through the City Office entrance on the on the east side of the building. We have two dedicated wheelchair seats in the orchestra section, each with companion seats. In addition to the wheelchair seats we also have 8 seats at the end of selected rows with arm rests that fold up for those with limited mobility. The balcony is not wheelchair accessible. If you need access to any of these seats, or have other questions about our accessibility features, please contact the LOH Box Office. How do I request an appearance by my favorite artist? We always welcome programming suggestions for. You can email your recommendations to info@lebanonoperahouse.org. How big is the Opera House? The Opera House seats 803, including eight transfer seats with removable armrests and two spaces for wheelchairs. The orchestra level holds 582 and there are 221 seats in the balcony, with room for up to 20 to stand in the rear of the theater.